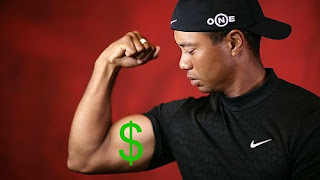 I just read today in The Australian about Tiger Woods being paid $3M to play in this year’s Australian Masters. All he has to do is show up and he’s $3M richer. What makes it even more amazing is that the winner of the event will only take home $270,000. Does this seem right to you? Now I know this isn’t really “new”. We’ve seen the best players paid to play many times, but it still feels wrong to me. I understand why it is, but I just wish it wasn’t. When does it become too much? Going Down Under for $3M seems over the top to me. The pay differential is astounding to me. I’ve heard all the reasons about sponsors yada yada yada, but it’s still just wrong. Golf is a game of inches and an equalizer on the course for men and women, but not when it comes to money. It still bothers me that the PGA generates about 100 millionaires every year – last year the LPGA had only 13 ladies break the $1M mark. Feel free to tar and feather me on this one, but I’m starting to get a bit tired of the Tiger frenzy. Even when he didn’t play for 8 months, all you ever read or heard about on TV was Tiger and his bum knee. I found it rather nauseating. I agree. I was wondering what golfers they would attract if they put up a $3million purse instead. Tiger regularly plays in Ireland for no money so it’s not entirely fair to blame him. He’ll bring $3m of commercial value so to be honest I don’t really see what the issue is. He might as well take it. Thanks John! Thanks for your comment. Yes, it would be hard to turn down the cash. 🙂 But this begs the question – why Ireland for free and not Australia?